Sign of the times ......? Without appearing to be critical, I would say that younger people have grown used to getting more for less. They've never really known hardship, not known hunger, not really known what it's like to go without anything really. With that in mind, I would suggest younger people are not expecting to bear discomfort for fashion. A long time ago (100+ years) it wasn't unusual for a woman to wear a corset whenever she was awake. During the 1940's 50's and even 1960's, a woman might not be considered 'dressed' unless her shoe had a heel, even for work. Mrs Freddy can remember never leaving the house without a high heel shoe on her feet (as with two other ladies from my past). Wearing a high heel isn't easy. It slows you down, and badly fitting shoes can hurt. (I'm lucky with that, as my feet aren't prone to pain even with an open wound.) I've seen girls out with high heels, and of course fashion shops sell many pairs, but recent (10-15 years) experience increasingly suggests these heeled shoes are for 3-4 hours out in the evening - not for all day use. Often, high heeled shoes are not even worn for the whole evening. I've seen girls slip their heels on at a bar entrance, and remove them just before or immediately after the night out. In other words, they've worn them to get attention (by looking more attractive), not as a lifestyle statement. Older ladies will be used to enduring some mild discomfort to look good. Most will have given up of course, but some are die-hards - thankfully. I saw one recently. I would put her at late 30's early forties. Blonde, with hair extensions. Black skirted suit and quite trim. Had some lovely knee high boots on, with 4 inch stiletto heel. Not poor, to even quite well off. She had the look of someone who is used to being out dressed, possibly she used to be an air-hostess, or someone with her own boutique. Certainly, members here would have noticed her. The last time I saw anything vaguely similar, was Oxford Street during spring, when I saw two WAGs leaving a large department store and get into a black cab. 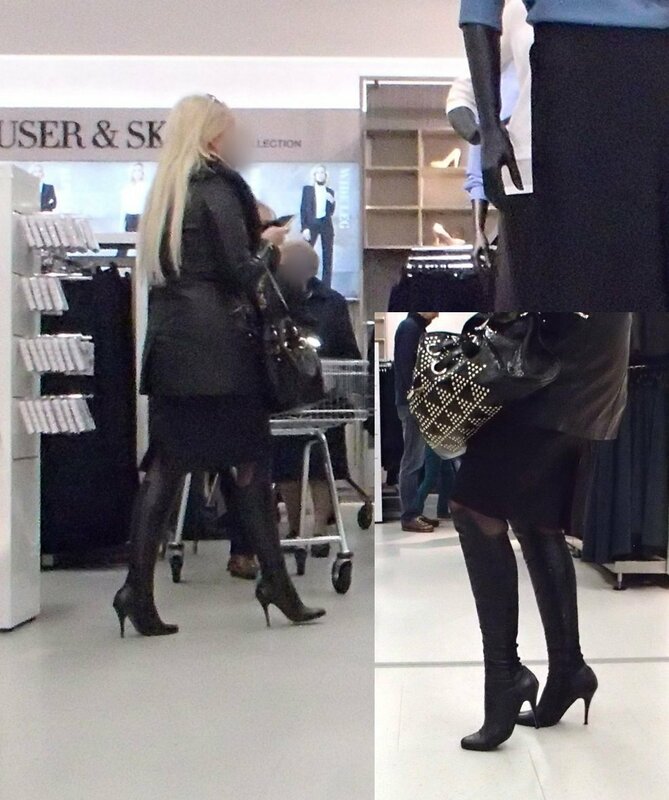 There is at least one store I know of, where seeing women of all ages walk around shopping in a heel, is something I can expect. These are 'ladies who lunch' of course. Meaning they have partners who provide enough wealth for the children to be with a nanny or away getting a private education, he is busy working, so the lady fills her day meeting friends for lunch or shopping in town. Not only do they have the money to buy nice shoes, but the time to wear them too possibly? Younger/poorer girls, are too busy/late/in-a-rush to wear a heel maybe? And perhaps wisely, don't want to wear heels for very long periods in case they cause long term damage to their feet? I personally doubt it's wisdom though, more like; 'can't be bothered'. I realise this is a year old thread but the accuracy in the observation is undiminished. I have niticed much the same thing. Taller boots with heels are very much more frequently seen on mature eomen while the younger set, if they go for tall boots, prefer flats. Either way there does seem to be more taller boots around this season. And specifically OTK boots. We can probably thank the Kardashian franchise for that. Even the younger members seem to like them.